The Rizzo “RESPECT ME” game. The Cubs are trying to advance to the league championship series. The Nationals stand in their way. With the series tied 1-1, Rizzo hits the game-winning hit in the 8th inning. He yells out RESPECT ME! RESPECT ME! I had the honor of attending this game in person, so of course I kept a scorecard. 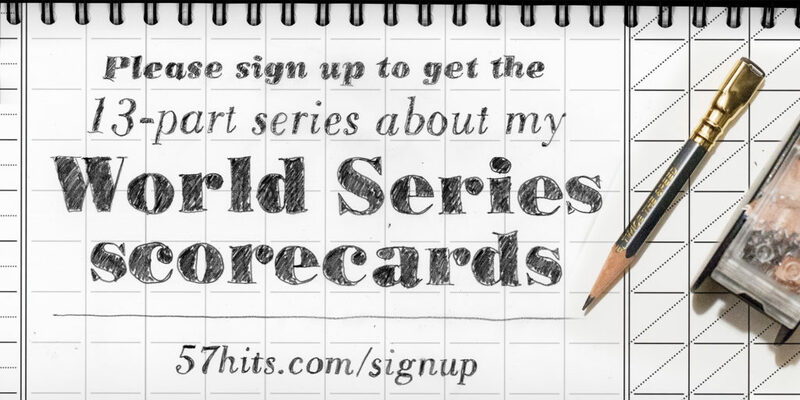 I’m still adding flourishes to the scorecard, so I’ll update this blog post as I make progress. Game 3 of the NLDS is the Cubs first postseason game at Wrigley in 2017. That means the first postseason game at Wrigley since the World Series last year! The weather was great. 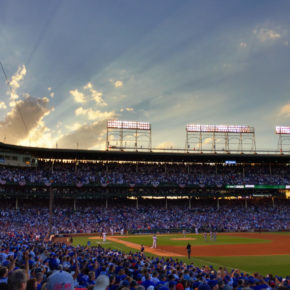 Here’s a nice shot of Wrigley with sunrays beaming behind the park. This was taken just after the Cubs tied the score 1-1 with Albert Almora Jr driving in Ben Zobrist. We really needed that run, because the Cubs were being no-hit through six innings! 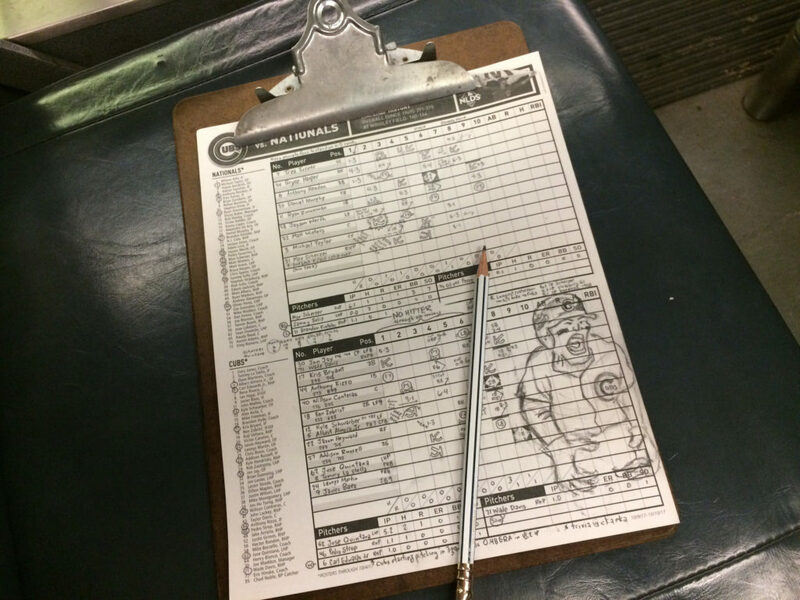 After the game, I love adding extra details and drawings to my scorecard. This summer my wife and I bought a new house in Glen Ellyn. Now I have a 40-minute train commute into downtown Chicago every day. This gives me plenty of time to work on adding flourishes to my scorecard! Here’s the scorecard sitting on the Metra seat as the train pulled into the Ogilvie Transportation Center downtown. 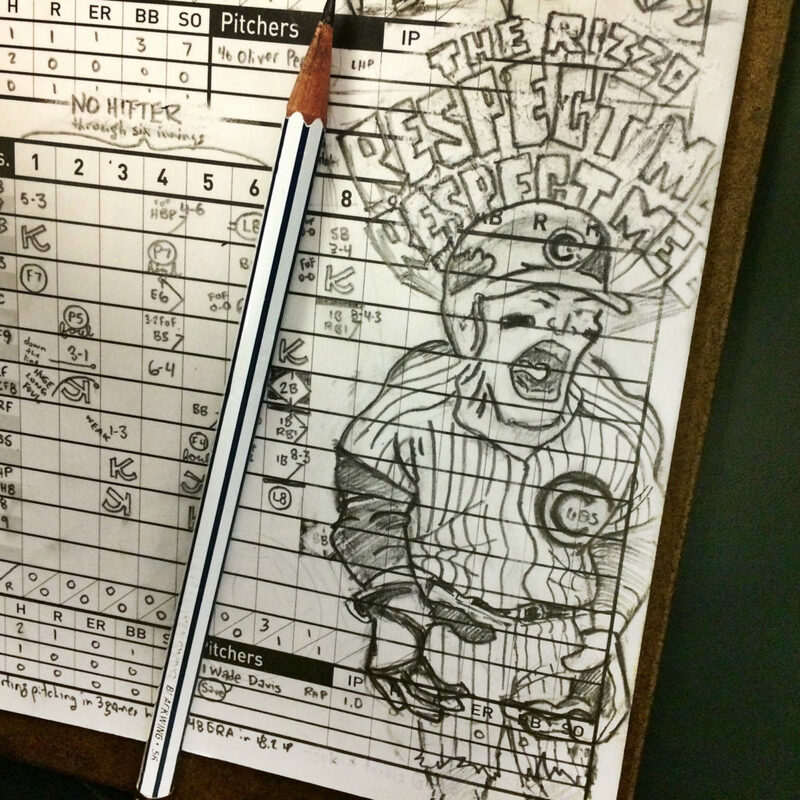 The beginning sketch of Anthony Rizzo is taking shape in the bottom right half of the scorecard. Rizzo was so upset as he was screaming “RESPECT ME! RESPECT ME!” that I wanted to draw him like he was the Incredible Hulk. 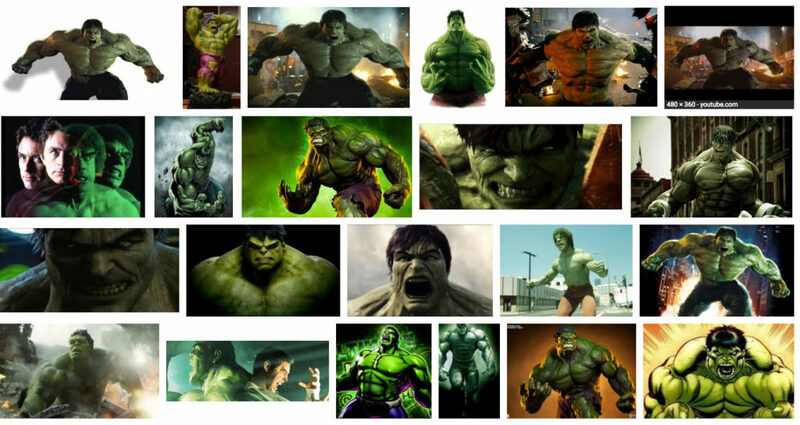 In fact, I searched Google images for: Incredible Hulk Angry for inspiration. The hunched-over back and giant expressive hands appealed to me the most. So Rizzo gets those traits in this drawing. Some more details added into Rizzo along with the words at the top. “RESPECT ME! RESPECT MEE!” are drawn in the style of the Incredible Hulk title font on the comic book covers. Rizzo yelling out “Respect me!” was a very odd sequence to me. He bloops a ball into the outfield. Three Nationals players can’t decide who wants to catch the ball, so it drops between all three players. Leonys Martin scores from second base. Cubs are ahead 2-1. But as this play continues on after Martin scores, Rizzo decides to try to turn his single into a double. He gets tagged out very easily halfway between first and second base. In fact, Rizzo didn’t even really try to make this into a run-down. He just stood there and allowed the first basemen Zimmerman to tag him.